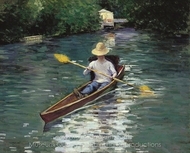 Gustave Caillebotte was a French painter, member and patron of the group of artists known as Impressionists, stamp collector, and yacht engineer. 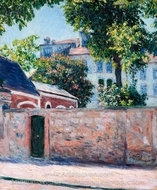 Caillebotte's style belongs to the school of Realism. 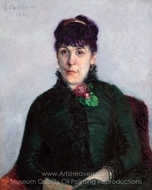 As did his predecessors Jean-Francois Millet and Gustave Courbet, as well his contemporary Edgar Degas, Caillebotte aimed to paint reality as it existed and as he saw it, hoping to reduce painting's inherent theatricality. 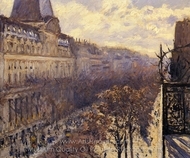 He also shared the Impressionists' commitment to optical truth. 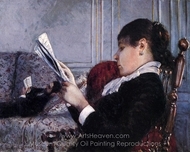 Caillebotte painted many domestic, familial scenes, interiors, and figures in a landscape at Yerres, but he is most well known for his paintings of urban Paris, such as The Floor Scrapers, 1875, Le pont de l'Europe, 1876, and Paris Street, Rainy Day, 1877. 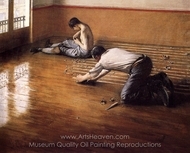 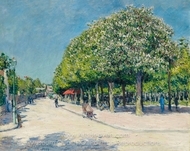 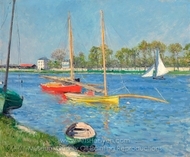 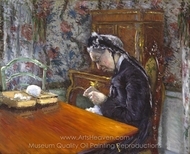 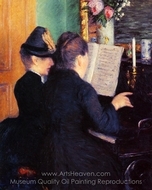 For many years, Caillebotte's reputation as a painter was superseded by his reputation as a supporter of the arts. 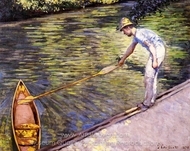 Seventy years after his death, however, art historians began reevaluating his artistic contributions. 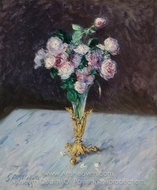 Forty of Caillebotte's own works are now held by the Mus�e d'Orsay. 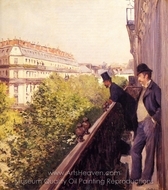 His L'Homme au balcon, boulevard Haussmann, painted in 1880, sold for more than $14.3 million in 2000.